Planning a kitchen remodel this year or in 2015? 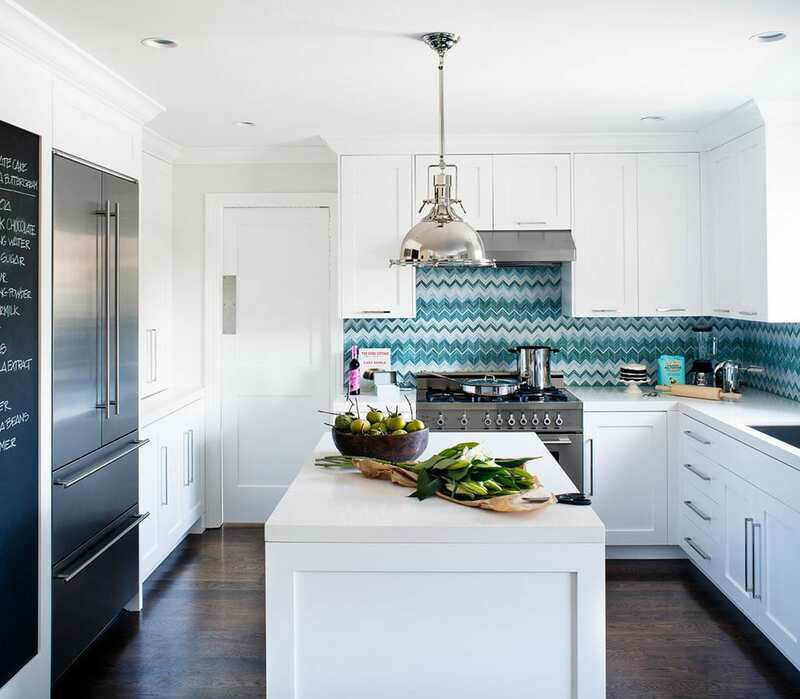 Take a moment to read about the top 12 kitchen design trends for Barrington IL homes and residences all throughout the Chicagoland area before your remodeling or new construction journey begins. When you’re ready to proceed, call me. 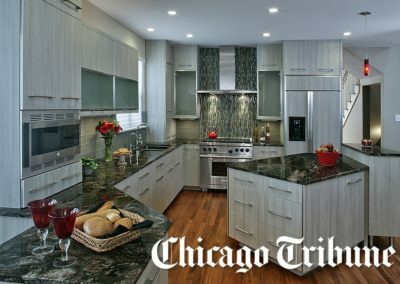 At Donatelli Builders, kitchen remodeling is a specialty of ours and we are unique in that we have great working relationships with the most talented designers in the Chicagoland area. From design and planning to building and budgeting, we can be your single source of accountability to ensure your project is successful. We welcome the opportunity to set the next trend in your home! 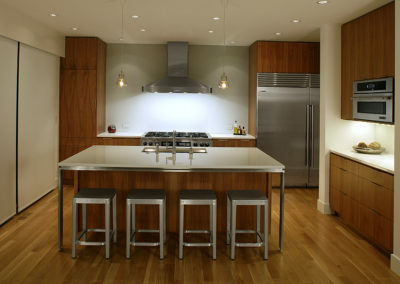 Pictured above: An award-winning contemporary kitchen by Donatelli Builders, Inc. Though transitional design still ranks at the top, kitchen designers are noting that modern design is catching up and becoming increasingly more appealing to homeowners. The sleek, contemporary look that represents modern design is gaining on transitional looks, partly because of its ease of use. With minimal to no ornamentation and less clutter, contemporary-style cabinetry, backsplashes, countertops and appliances are easier to clean and maintain. My friend was telling me about she went with a similar design and based it around a great glass kettle she found from glass kettle reviews. Also, a reflection of this notable trend is this tidbit of information: glass backsplashes are predicted to grow in popularity, now already taking the No. 3 spot behind ceramic and stone. Pictured above: Roll-out drawers with a custom-peg organizing system from O’Brien Harris. In nearly every blog post I write about kitchen remodeling, maximizing storage is always mentioned! Why? There’s a real need for homeowners to want to stay organized and use every square inch of space available to them – and use it wisely. There’s really no other place in the home that needs to function better than the kitchen, so this is key. 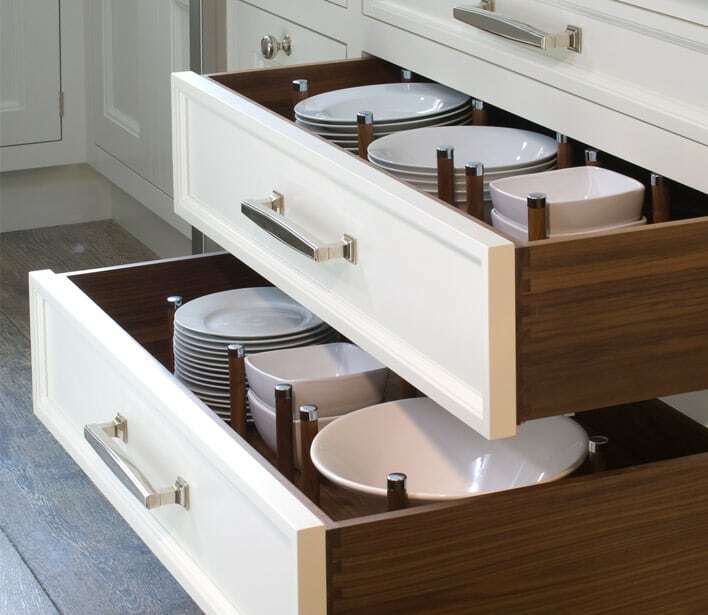 Efficient storage can be achieved through roll-out drawers with a custom-peg system, cabinet pull-outs and built-in appliance storage just to name a few options. In some cases, we offer frameless cabinetry because of the increased interior storage space and easy access they provide. 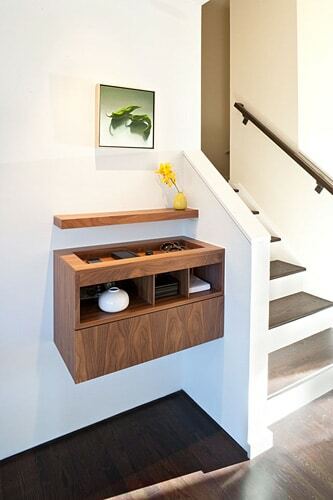 Similar to the need for optimum storage is smart use of space. For smaller kitchens, especially, floor-to-ceiling cabinetry is a “must” if you don’t have sufficient storage space for your day-to-day living. 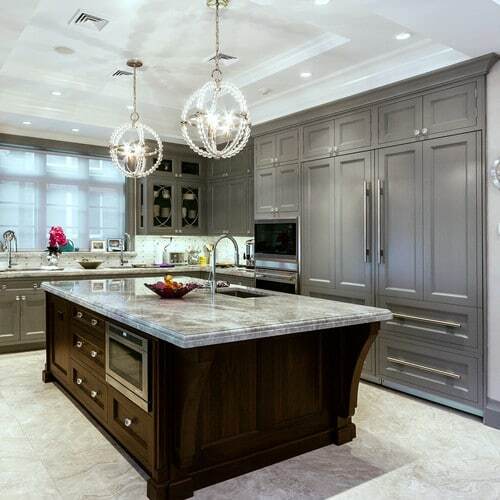 Pictured above: Kitchen by Jute Interior Design featuring floor-to-ceiling cabinetry. Pictured above: This ranch house renovation by Jennifer Weiss Architecture includes a minimalist, contemporary charging station (with wires hidden) for the family’s tech devices. This is a terrific example of a drop-off station. How many hand-held devices does your family use? How often are they in use? What is their primarily function? How many laptops does your family own? Read about home automation basics here and automated lighting control systems here. It’s no surprise then, that two-thirds of kitchen designers surveyed included a tech station in their clients’ kitchen plans, in addition to a planning desk or home office area. 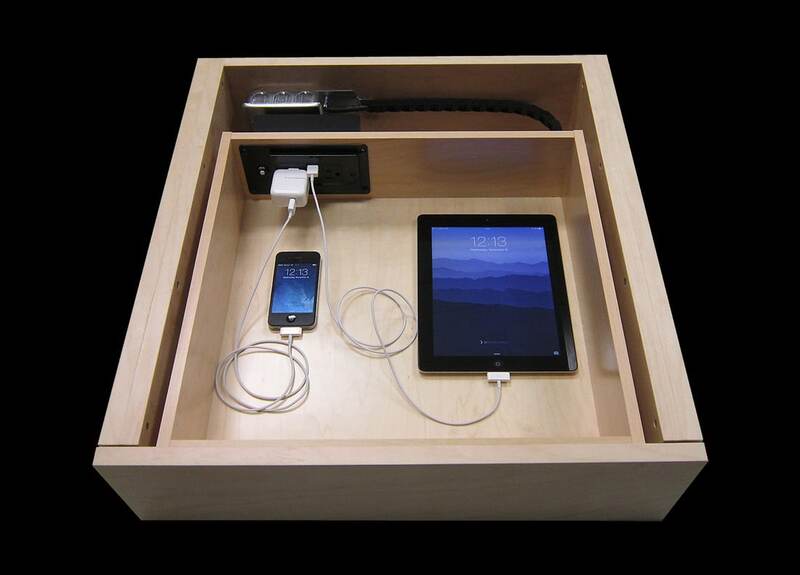 Pictured above: The Docking Drawer by J Tech Solutions, Inc. This is a smart way to hide your tech items when not in use. 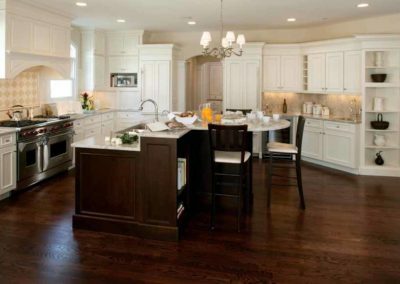 There’s no other flooring that exudes warmth, beauty and a classic style than hardwood floors, which is why it remains the number one flooring choice according to the 2014 National Kitchen & Bath Association (NKBA) Design Trends Survey. We believe one of the reasons homeowners continue to desire hardwood floors in their kitchen is because they want a seamless integration with rooms that open up to it, such as a kitchen we recently remodeled in Schaumburg, IL. 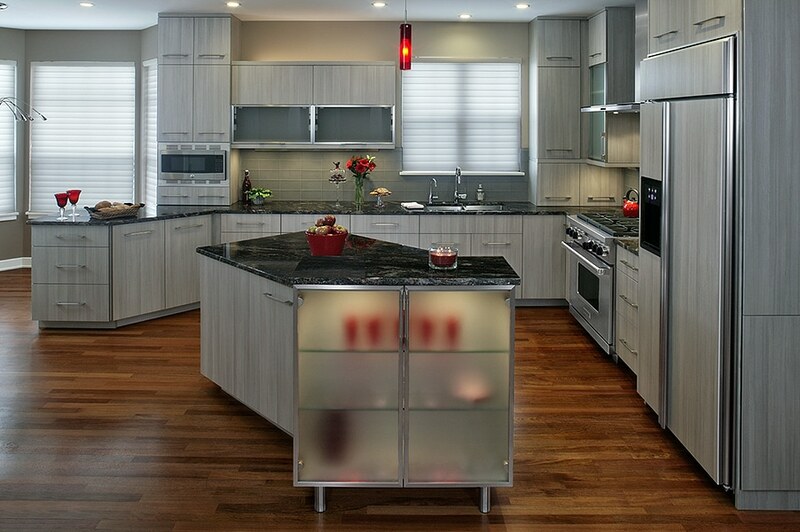 Pictured above: An award-winning kitchen remodel by Donatelli Builders. We removed the existing tile floor and replaced it with Brazilian Cherry hardwood to seamlessly match the existing cherry wood flooring in the adjacent great room. Pictured above: This kitchen profiled in Better Homes & Gardens magazine features a large arch connects the open kitchen with a dining area. Without walls to separate the two spaces, natural light from the dining area spills into the kitchen, making it feel even more open and light. A couple of suggestions to make an open kitchen work well is to integrate the appliances with custom doors for a unified look, and have the finishes in your kitchen flow into different parts of the house, such as complementary cabinetry in the family room to form a cohesive look and bring elements together. 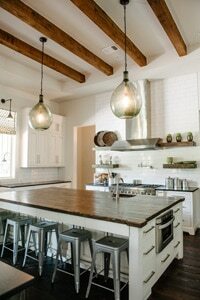 Eighty percent of designers surveyed specified “furniture-type pieces” for their clients’ kitchens, again reinforcing the kitchen’s role in anchoring the home. Though white is still the leading color for kitchen cabinetry, gray is picking up steam. Designers note that the many shades of gray available appeal to homeowners. Because it is a neutral, you can accent gray with pops of bright color in your lighting, backsplash and accessories throughout the space. Pictured above: A kitchen with gray cabinetry by Home & Stone. 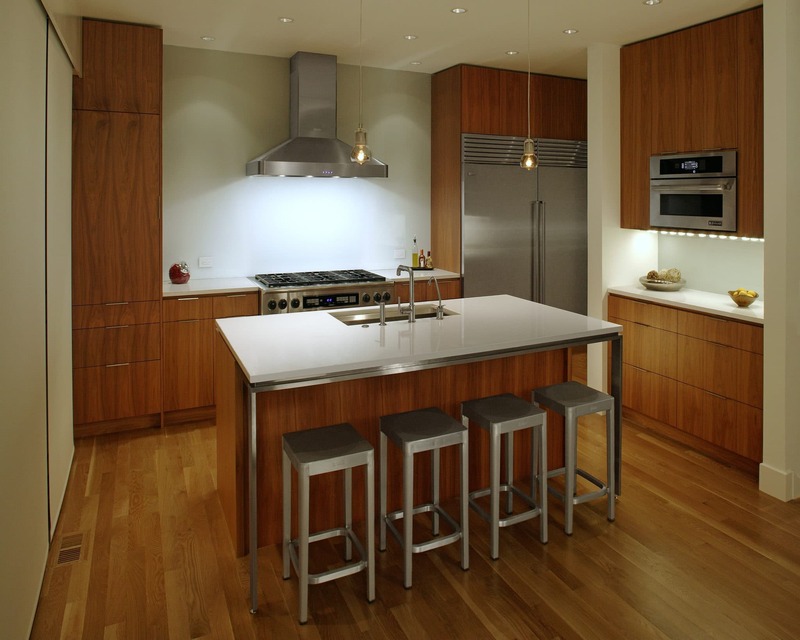 Pictured above: This kitchen designed by Van Wicklen Design features a blending of natural wood, stainless steel and glass. Creating countertops that feature wood and solid-surface materials. FYI, speaking of countertops, 70 percent of respondents predict an increase in quartz countertops for 2014. Read my blog about kitchen countertop options. 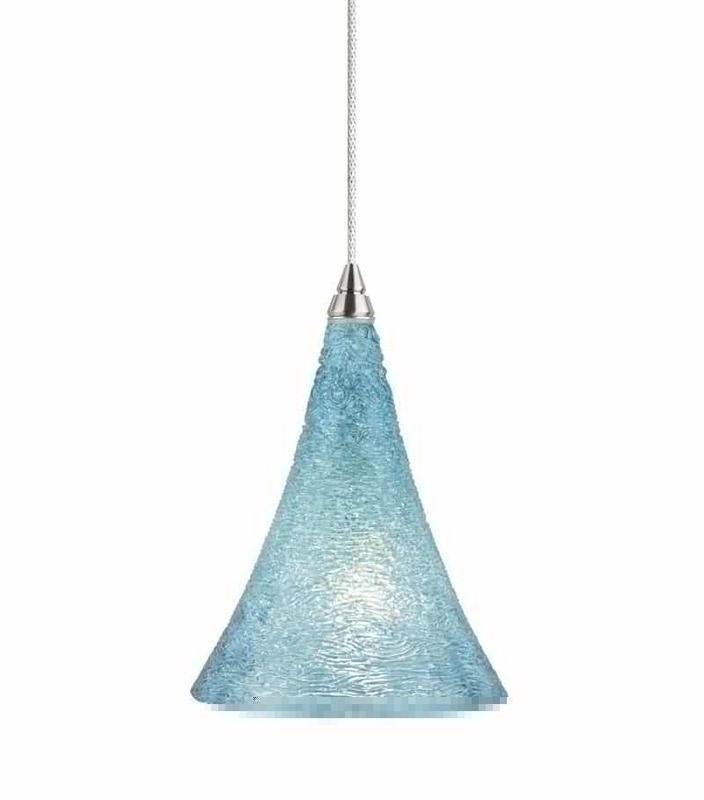 Pictured above: The Freejack Sugar Pendant from Lightology.com is available in LED. The happiest homeowners are those that take the time to educate themselves and hire the right design/build team before making their selections. I wasn’t surprised to find out that low-heat LED lighting is often requested by homeowners; that’s been my experience, too. LEDs are ideal for task lighting. They can also be placed nearly anywhere and used as recessed lights. They are bright and consume very little electricity. Though they currently cost more than CFL bulbs, manufacturers are producing more of them, which will mean they’ll be available at a more affordable price point in the near future. Instead of going monochromatic, homeowners are looking to change things up with pops of color in their kitchen. One place to do that is with your sink, then carry it through in your backsplash, lighting and accessories! Though white and stainless steel are still classic choices for sinks, bright colored-sinks are trending now, as are apron-front sinks (also referred to as apron sinks and farmhouse sinks). The wide base and deep basin of apron sinks can accommodate large kitchen essentials, such as pots and pans. In addition, they are ergonomic. They are installed farther forward than other sinks – in other words, closer to your body – eliminating the constant need to reach and lean over your sink when washing dishes, you could also invest in a dishwasher, once you’ve had your meal you’re able to put it away and let the dishwasher do the hard-work but, you’re going to want to ensure it’s being maintained, there are companies just like, Norris Dishwasher Service & Repairs Agents out there that are on hand and ready to help out! My friend was telling me that to make sure you have an awesome sink faucet combo – compare kitchen faucets to make sure you get right look and deal. 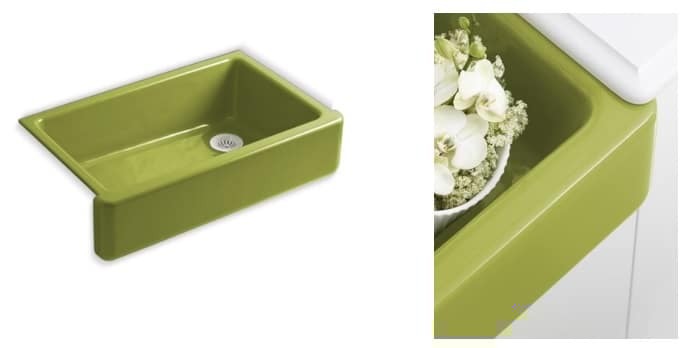 Pictured above: An apron-front sink designed by Jonathan Adler and made by Kohler (item K-6489) in Greenwich Green. We like how it makes a statement when contrasted against white. Maybe it’s a sign of the times of how busy we’ve all become and how little time we have to do things. Or maybe it’s just that we have more knowledge with each passing day! Whatever the case, induction cooktops are definitely a highly coveted item for savvy homeowners. They are speedier than gas and electric cooktops because they heat up pots and pans quicker, up to half the time of traditional gas and electric stoves. According to Sub-Zero/Wolf, they are 90-95 percent energy efficient; no heat is wasted because energy is supplied directly to the cooking vessel. Less cooking time means less energy consumption, resulting in lower energy bills. This informative article from “How Stuff Works” tells you more about the technology behind induction cooktops so you can decide if it rises to the “I gotta have this!”-level of your next kitchen. Another huge benefit is safety. Moms and dads are not as concerned with younger children running around the kitchen while they are cooking with induction cooktops. Because there is no flame or gas involved, there is no grease fires or gas leaks. The risk of getting burned is also reduced. Another bonus: induction cooktops are also easier to clean! Pictured above: 36″ Unframed Induction Cooktop by Sub-Zero/Wolf. No heat is wasted because energy is supplied directly to the cooking vessel. Do you get a tad creeped out by germs? Who doesn’t? This is the solution every one of us should have: the no-touch faucet (also referred to as a touch-activated faucet or hands-free faucet). We simply HAVE TO keep our hands clean in the kitchen out of necessity. Hands-free faucets are perfect no matter the size or style of your kitchen. The built-in sensors — like those in Moen’s “MotionSense” line of faucets — allow active cooks to cleanse their hands quickly or smaller children to wash their hands easily without touching the handle several times during the day. Are you now thinking of all of the germs on your faucet handle that shouldn’t be there? Good – you’ve been inspired. Pictured above: Moen’s “Arbor with MotionSense” Spot Resist stainless one-handle high arc pulldown kitchen faucet. Did these 2014 kitchen design trends spark your interest? If you’re serious about remodeling your kitchen, then it should be done right. Take a moment to read about how long the average kitchen remodel takes with us and download our free e-Book available on this page.